I awake to our 6 year old frantically screaming his sister’s name. This little lady could sleep through a hurricane. Me, not so much. I look down from the top bunk, eyes still half closed but managing a glare, and ask him what on earth he’s screaming about. He stares at me blankly and points out the window of our cabin, to the lights of Devonport. “Oohhh” is all I can manage in reply. By now Lori and the fairy princess have awoken, and the excited energy and chatter in our little cabin starts to build. We’re eager to explore somewhere new and to enjoy some time outdoors. Surprisingly, considering the tech-savvy little family that we are, we’re even eager to disconnect for a while. “This is the start of Tasmania, isn’t it mum?”, the fairy princess asks. It’s the start of much more than that for us. Travelling on the Spirit of Tasmania has already proven to be quite the brilliant idea, especially considering we’re with the kids. Without the stress of luggage restrictions (think car seats, hiking and camping gear, or fishing rods), crowded airports, trying to get the kids to sit still for hours, and then sorting out a hire car upon arrival, there’s been plenty of headspace to kick into relaxation mode. After setting sail last night, we explored the ship, had a play in the playground, sat on one of the decks breathing the ocean air while watching Melbourne slip away into the horizon, and scoffed a tasty dinner composed of fresh Tasmanian produce at The Leatherwood Restaurant. We rented a Shipmate personal player so the kids could watch a movie before bed, and then Bass Strait gently rocked us all to sleep. We get ourselves ready and vacate our room. Getting off the Spirit is a breeze, despite the cars being jammed into the lower levels like a perfect game of Tetris. Before we know it, our adventure begins. Bookings for travel can be made online via the Spirit of Tasmania website. The twin ships depart Devonport and Melbourne nightly, arriving at their destination early the following morning. During the summer high-season, daytime sailings also depart in both directions in the early morning. The ship features a travel information centre, gift shop and general store, playground, arcade, restaurants and a café, a cinema with movies screening on both day and night sailings, and multiple bars. During summer, day sailings offer children’s activities and live entertainment for the grown-ups. While the views might be better during the day, I recommend taking the night trip. Sailing time is roughly 11 hours so that’s a long time to spend on a ship, no matter how lovely the facilities and staff. Our accommodation on the ship a four-berth cabin which, while cosy, was perfectly adequate considering the few waking hours we spent in there. 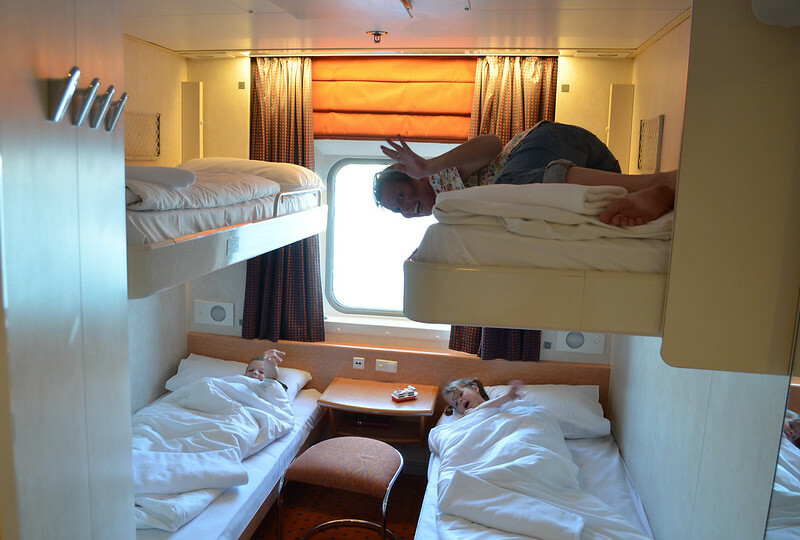 There are also two-berth and deluxe cabins (which feature a queen-size bed). All cabins have private ensuite facilities. Ours had a porthole view, but rooms are available without. If travelling without kids sometime in the future we’d probably go for an Ocean Recliner, which is a comfortable reclining chair in a private lounge with swipe-card access, individual reading lights, and floor-to-ceiling windows. A perfect option for those who are budget-conscious. Breakfast options in Devonport at this time of the morning are limited, so we drive about 10 minutes south to House of Anvers Chocolate. Set on a little over a hectare of picturesque gardens, an 80 year-old Californian bungalow has been turned into a chocolate factory. It’s like some kind of heavenly oasis. If you think a chocolate factory is a fairly decadent place to be eating breakfast, you’d be right. What ends up on our table is the most deliciously decadent breakfast offering I’ve ever seen. I go for the most savoury choice – a rich Ashgrove Cheese and perfectly poached eggs on a toasted croissant – while the others take full advantage of the sugar-fix opportunity… Rice Bubbles in home-made chocolate milk, Belgian waffles, and a ‘chocolate breakfast’ (a croissant, a chocolate croissant, brioche, and a rich chocolate fudge) – all of them covered in flakes of Anvers Chocolate. Barely able to move from the delectable feast, it’s time to set off on a tour of the factory. All of Anvers chocolate is made in this one small building, which also comprises a cafe, function centre, and a small chocolate museum. It was founded by Igor Van Gerwen, who immigrated to Australia from Belgium after training as a chocolatier. He worked for many Australian catering companies before being convinced to open his own store, specifically for the purpose of making the most mouth-watering chocolate you’ve ever tasted. One of the chocolates that Anvers have sourced and produced is the organic Peruvian Pure Nacional Dark Chocolate – Fortunato No. 4. It’s made from the world’s rarest chocolate and is a direct descendant of the original mother cacao tree. It’s only known to grow in one place, and that place currently remains a secret. If you’re into dark chocolate, this is the stuff to be eating. I was also very happy to hear that, with all Anvers chocolate, they do their best to ensure a fair deal for the growers. Igor has become something of a chocolate historian. His ‘chocolate museum’ is where you can view all the ingredients used to make premium chocolate, as well as read the history of chocolate making from its beginnings until now. There are ancient chocolate boxes- still with the chocolates intact inside, and chocolate moulds that date back to the 1800’s. It’s an impressive collection, and much of it sourced from people who have visited the factory and realised they had something at home to contribute. After hearing about the history of Anvers, we head to one of the two large glass viewing windows that allow visitors to see into the chocolate factory itself. 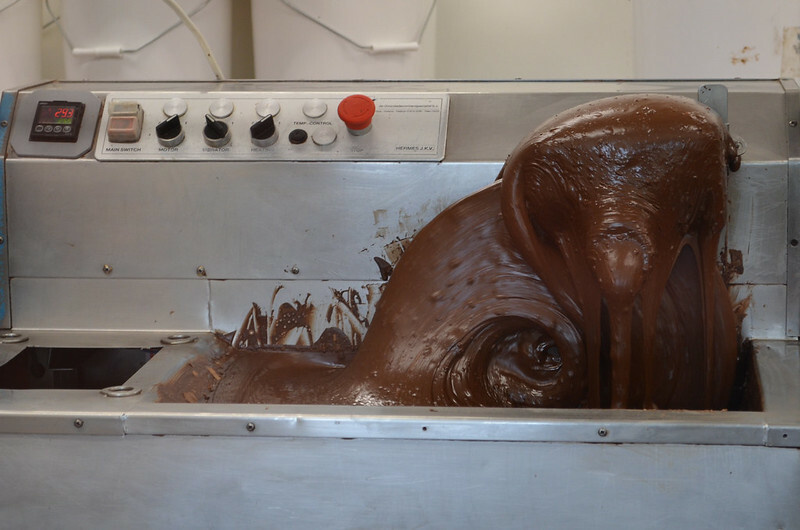 The rolling, churning chocolate starts my mouth watering, and is somewhat mesmerising. The kidlets are fascinated by it and could happily stand for hours, watching truffles being coated and chocolate bunnies poured into moulds. The staff here are lovely and, even when one of us (I won’t mention names) drops a bowl of chocolate buttons (the best chocolate buttons ever) that we’ve been munching on during the tour, they still manage to make us feel right at home. This is already starting to seem like the trend in Tasmania. People are just so nice. We finish our tour with a few more taste tests from the Anvers Tasting Centre, and grab ourselves some deliciousness to take home with us. There are fudges, truffles, and blocks of chocolate in different flavours. I’m blown away by the salted caramel block. It’s the most incredibly chocolaty treat to ever have crossed my tongue, and I don’t see anything ever topping it. House of Anvers is located at 9025 Bass Hwy, Latrobe. If you can’t make it to Tassie, I’d still highly recommend that you try their chocolate. You can order it through their online shop, or check out their retail shop in Sydney. Anvers is part of the Cradle to Coast Tasting Trail, which includes some of the best food and wine in the north of Tasmania. Ashgrove Cheese (6173 Bass Highway, Elizabeth Town) and Christmas Hills Raspberry Farm (9 Christmas Hills Rd, Elizabeth Town) also come highly recommended. Unfortunately we didn’t get a chance to visit. As I’ve mentioned, I did get to have some Ashgrove Cheese though. It was divine. I hear the raspberry milkshakes at Christmas Hills are like no other. We wander along a boardwalk that protects the thick carpet of emerald green moss below. 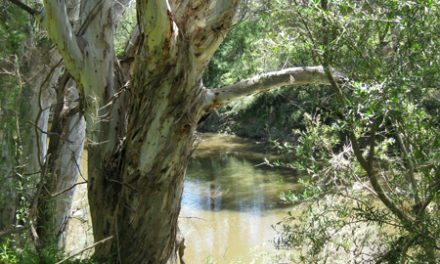 On one side is a thick tangled mess of lichen covered trees that border the Pencil Pine River. On the other is Buttongrass moorland, dotted with wombat burrows. There are no sign of wombats but, apparently, they are commonly spotted by bushwalkers. Alas, our kidlets haven’t quite figured out how to walk quietly in order to see more wildlife. The fairy princess sings and chatters away to herself while I focus, as I probably do too often, on capturing this paradise in photos. Lori and Chop have fallen a short distance behind. Getting There: Park at the ranger station and interpretation centre, and then cross the road to the trailhead. It is very well signed. Grade: Easy (this walk is suitable for wheelchairs, strollers, and those with limited mobility). Getting There: Park at the ranger station and interpretation centre. The trailhead is to the left of the interpretation centre building, near the picnic shelters. 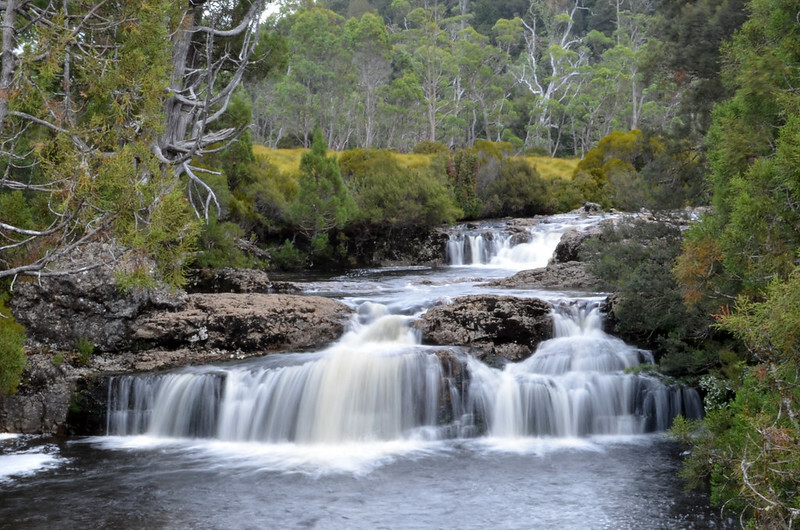 Walks in Cradle Mountain-Lake St Clair National Park range from the easy 20 minute walks above through to day trips and the 6-day Overland Track. 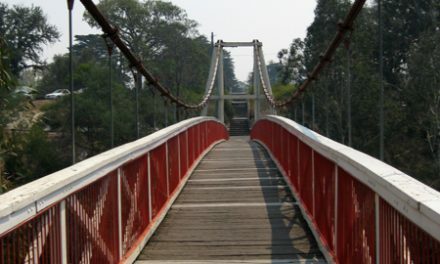 Some of the most popular are the 3-hour Dove Lake Circuit, the 2 and a half hour Marion’s Lookout walk, and the full-day Cradle Mountain Summit hike. 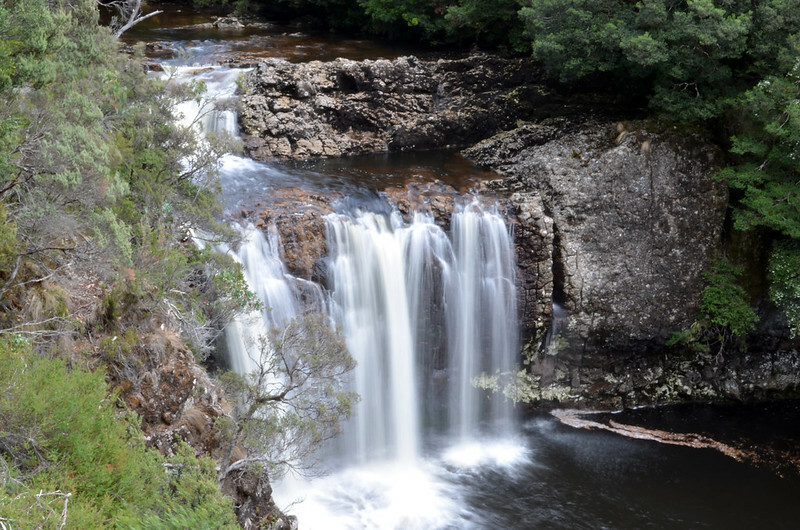 Plenty of information is available on all hikes in the park, either online or via the many Tasmanian hiking guidebooks. Even if only doing short walks, it would be handy to bring along a topographic map of the area. We turn to find her and Chop crouched, staring through the scrub at a Bennetts Wallaby, only a couple of meters from the boardwalk. We join them and watch in awe as it sniffs around, eats, and scratches itself, completely unfazed by our presence. Eventually it hops off back towards the trailhead and we continue on our way with a chorus of “how cute was that?” from all four of us. This is the Enchanted Walk, one of Cradle Mountain-Lake St Clair National Park’s shortest walks. Sitting just inside the gates of the park, it makes the perfect introduction, especially for the little ones. The boardwalk continues on to make a loop, following and then crossing the river. When we come upon an information ‘tunnel’ that stands at about waist-height, we realise that this walk is really kid-focused. Our kids don’t show much interest in the information provided, but clearly love the fact that there’s something especially for them. 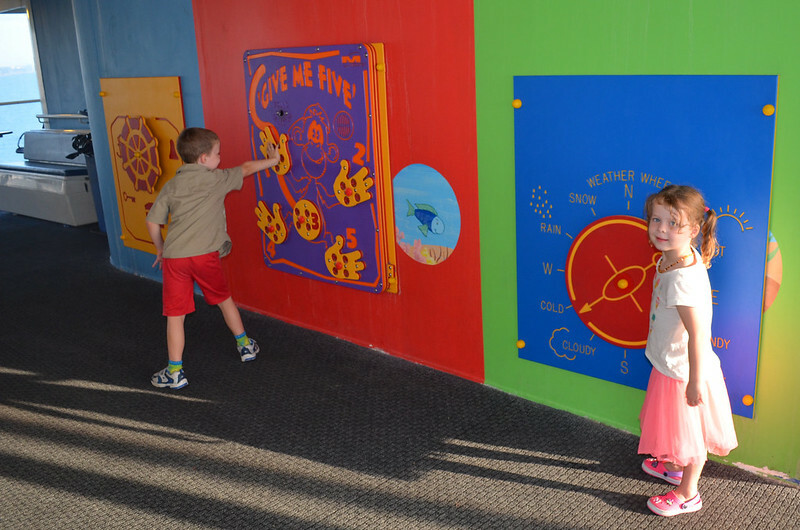 We pause or walk while they play in the tunnel, being their delightfully feral selves. Eventually, we find ourselves back at the road. As we cross over, we get a perfect view of Cascade Falls, which we could hear at the start of the trail. Having taken our time on this walk, and having spent ages at Devils @ Cradle (see “Need to Know” breakout box), we’re already starting to run out of daylight. So we elect to do another quick walk before heading back to Devonport. 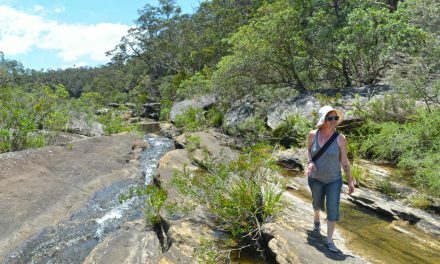 There’s a perfect one just across the road next to the ranger station and interpretation centre, the Pencil Pine Falls Rainforest Walk. Soon we find ourselves on another boardwalk, ducking our heads under mossy Myrtles and being scraped at by the branches of mountain peppers beside the track. After a few minutes, we find ourselves on a platform overlooking the natural amphitheatre created by Pencil Pine Falls. We can barely hear each other speak over the sound of the tumbling water, but it doesn’t block out the piercing warble of a Black currawong. We don’t spot any other animals as we continue on this short circuit walk, but apparently many walkers do see wombats and pademelons. After 10 or 15 more minutes of marvelling at the diversity of this section of forest – celery-top pines, cider gums, leatherwood, pepperberry, and waratah trees to name a few – we find ourselves back at the interpretation centre. We head inside for a quick look, but it’s time for our far too short visit to the Cradle Mountain-Lake St Clair National Park to end. We’ve already decided to come back well before we pile back into the car. Next time we’ll stay much longer. If you’re keen on seeing more of our little family holiday to Tasmania, check out part 2 of Tasmania with Kids, and also this wee video I put together… The fairy princess does her best TV host impression. Cuteness abounds. During our trip to Tasmania, we were guests of the Spirit of Tasmania, Corinna Wilderness Experience, and Edgewater Devenport. 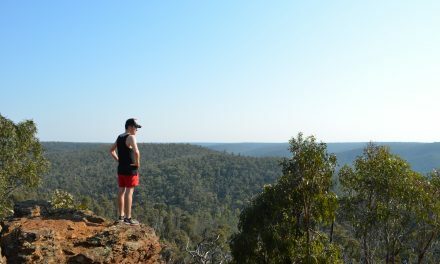 As is always the case, this has no influence over the opinions I present on Bushwalking Blog. If you’re doing a similar trip, especially if travelling from Devonport to Cradle Mountain or visiting Corinna, I’d strongly advise bringing a GPS that doesn’t rely on mobile data reception to show maps (ie. not a tablet or smartphone). Navigation would have been far more stressful for us without our car’s GPS, and that’s not when you need when there’s already kids in the car. We spent a night in Devonport at Edgewater Hotel, in a Spa Suite overlooking the Mersey River (right next door to where the Spirit of Tasmania docks). This is one of those unassuming hotels that might not look like much from the outside, but surprise you once inside. This is located within the Edgewater Hotel, so we visited for dinner and a buffet breakfast. It was very convenient after (and before) a long day of sightseeing and travel, to not have to go far for our meals. Food was delicious and the staff looked after us well. See the Edgewater Hotel’s website for details on opening hours. 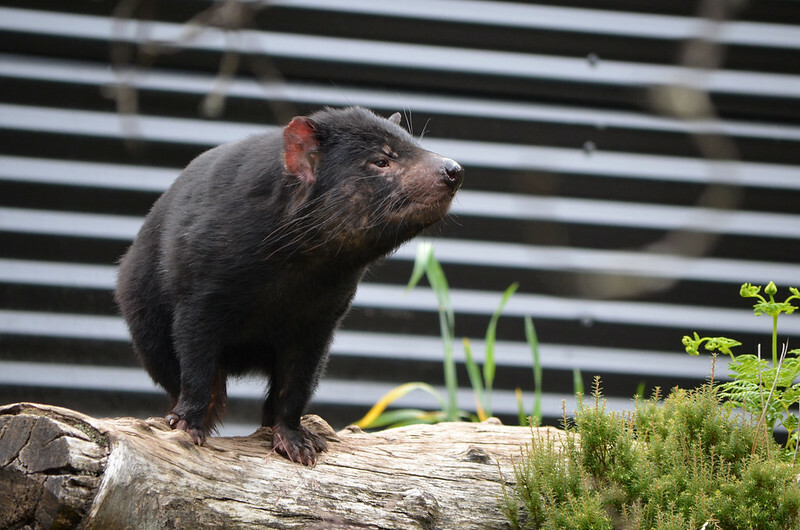 Tassie Devils and wombats and quolls… Oh my. It may be small, but this conservation park adjacent to Cradle Mountain-Lake St Clair National Park is well worth a visit. We paid $45 for the 4 of us to get in, which I didn’t find too bad. 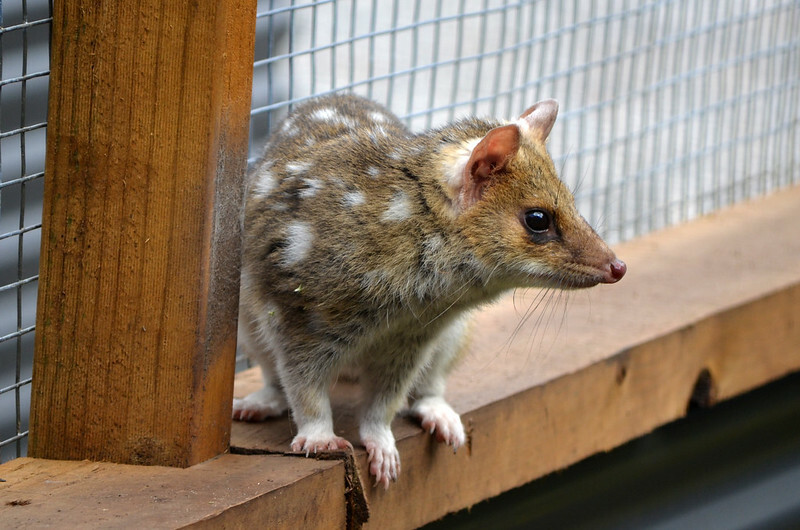 There were enough devils, and both Eastern and Spotted-tail Quolls to keep us entertained for a good hour but they weren’t even the highlight. We could’ve stayed all day to stare at the two adorable orphaned baby wombats, Woody and Willow. Guided tours are available with entry at scheduled times throughout the day, and night-time breeding tours are available at an extra cost. 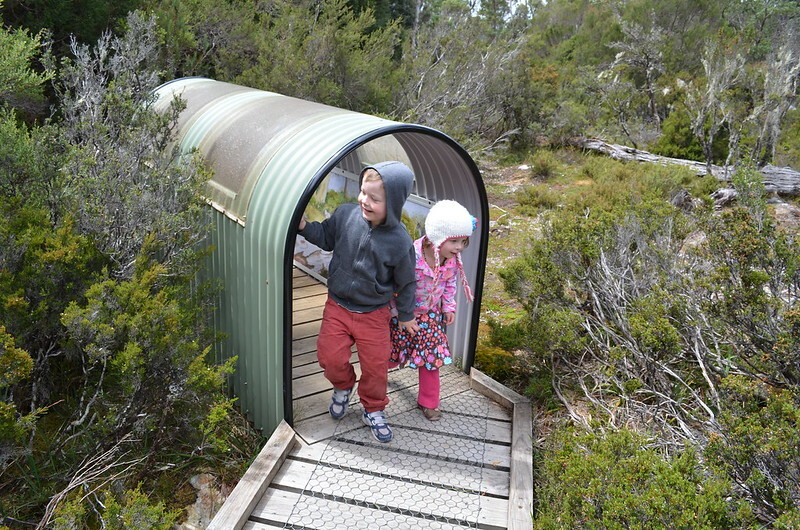 Have you checked out Tasmania with kidlets? Got any tips or tales to tell? Please let us know by commenting below. Great trip Neil! 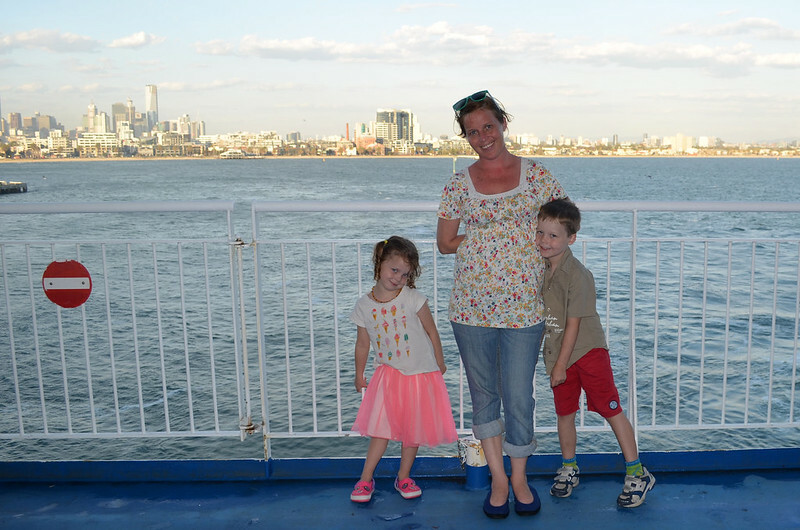 We did Tassie in January, took the ferry down for the same space & freedom reasons as you (kids – 6 and 8 – loved the bunks! ), and spent 2 days exploring the kid-friendly parts of Cradle. We managed to make it all the way up to Marion’s Lookout via Wombat Pool in half a (fine) day, and then did the Dove Lake Circuit through moderate rain the following day. Marion’s was steep, but the kids managed it pretty well, probably helped by having daypacks and not full overnight packs like the people we passed. Kids are very excited that they’ve walked part of the Overland Trail, which bodes well for the future – they can’t wait to do the whole thing when they’re older. Love your blog – always great to see people getting kids interested in the outdoors. That seemed to be really a great trip. Glad you liked the post, Adrien. Thanks for the comment. I love Tasmania, we just did a recent trip also on Spirit of Tasmania, to Hobart, Tamar Valley and Bruny Island. There is so much to see. That sounds like an amazing trip, too. I’d love to visit Bruny Island. Maybe next time! Thanks for the comment.